When Saskia Laroo and her band played at the Jazz Yatra in Mumbai in 2004, the audience was stumped when she stepped down the stairs with the glimmering brass instrument glued to her lips to be among them, all the while continuing the parade of enthralling notes. 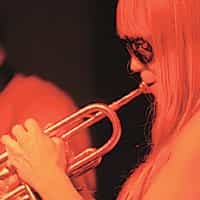 The Dutch trumpeter had challenged the sacred divide between performer and patron, and it has, over the years, become her signature style. “In the initial days, I was a little worried about whether I will be able to play from the audience but it has become second nature to me now," she says. “The idea is that a performance should be something where everyone is involved and not merely the musician playing while the audience is listening. It helps build a great atmosphere, and new things can happen, too." Laroo and her band are back for the third time in India, and will be performing in various cities as part of the European Union Cultural Weeks 2007. Laroo, whose website claims she’s known as “Lady Miles of Europe" (after the legendary trumpeter Miles Davis), is known for her funky “nu jazz" style where she combines elements of older styles of jazz such as bebop with newer music of today such as hip hop, rap, disco, house, drum and bass. What stays constant in all her performances, though, is a propensity to improvise. “That is the thing with the trumpet. Unlike a piano, you cannot be sure that if you put your finger on the same key, the same note will come out. This gives me a lot of freedom to not do the same thing," she explains. Of course, a lot of what goes into her performance is a result of meticulous planning and a systematic practice schedule. Playing her 20-year-old brass trumpet, for instance, requires supreme physical and mental fitness for which she does not smoke and does not drink. “Not even coffee," she adds. Laroo is in many ways a product of the late 1970s jazz scene in Amsterdam, of the heady excitement and youthful innovation generated by the concerts, workshops and jam sessions of those days. Ask her to what degree Indians have an ear for jazz, and she says she enjoys playing to Indian audiences much more than the ones at home. “They are much more spontaneous, have a feel for rhythm and respond very well to what I’m playing," she says. For her India tour, besides her trademark spatial calisthenics, Laroo hopes to integrate elements of Indian sounds and music into the compositions. “In India, even when they play jazz, it’s an entirely different phrase of music. There is so much to learn," she says. Saskia Laroo Band will perform at Sri Sathya Sai Auditorium in New Delhi on 1 December at 6.30pm. For information on other city stops, log on to www.saskialaroo.com.